Michael D. Yates is the associate editor of Monthly Review. 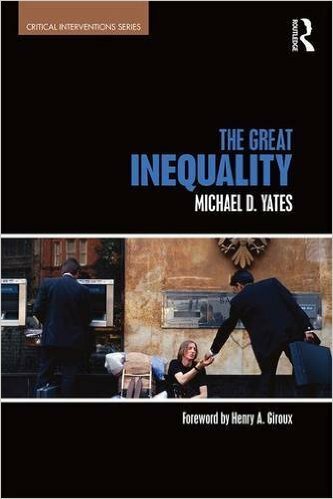 This article is adapted from Michael D. Yates, The Great Inequality (Routledge, 2016). It is by now well known that significant and growing economic inequality is a central feature of the U.S. economy, as previous articles in Monthly Review have shown.1 However, the same is also the case for much of the rest of the world. Inequality arises in other countries for reasons similar to those in the United States, but each nation has its own history, along with widely divergent economic and political structures. Here we will look first at the most recent data on global inequality, and then at its causes and consequences. We can compare inequality around the globe by looking at the Gini coefficient, a simple concept that allows us to track a single number whose rise or fall indicates an increase or decrease in inequality in one nation, or to compare relative levels of inequality in different countries. A Gini coefficient has a value of 0 if there is perfect equality of income or wealth. That is, if income or wealth is divided into fifths (quintiles), each one-fifth of the population (the poorest, second, middle, fourth, and richest quintiles) would receive exactly 20 percent of total income or wealth. If the coefficient has a value of 1, then one person, household, or family—depending on the type of income or wealth being compared—gets all of the income or wealth. The higher the number, the greater the inequality. Chart 1 shows this coefficient (for income) for most of the world’s rich nations, as well as for a few poor and rapidly growing economies outside of Europe and North America. Notice that the coefficient for the United States is exceeded only by that for Turkey, Mexico, Chile, Indonesia, Argentina, China, Latvia, Brazil, Colombia, and South Africa. Chart 1 cannot tell us whether income inequality has been rising or falling. We know that it has increased dramatically in the United States in recent years, but what about the rest of the world? Our knowledge here is inexact, because there are many nations, especially very poor ones, where data collection is either sparse or nonexistent. Casual observations seem to show that there is hardly a place on the globe today where the very rich do not dominate social, political, and economic life, and where those without means have not been suffering a worsening litany of woes, from dire poverty and underemployment to wars, hunger, and disease. Even the business-oriented World Economic Forum identifies rising inequality as an urgent global issue, one that is “impacting social stability within countries and threatening security on a global scale.”2 Given the data examined below, this is hardly a surprising finding, although the reference to “global security” mainly expresses the fears of the elite, and has little to do with the conditions of those who keep falling further behind those at the top. In any event, it is probably a safe bet to say that, in those countries where decent data are not available, inequality has grown. 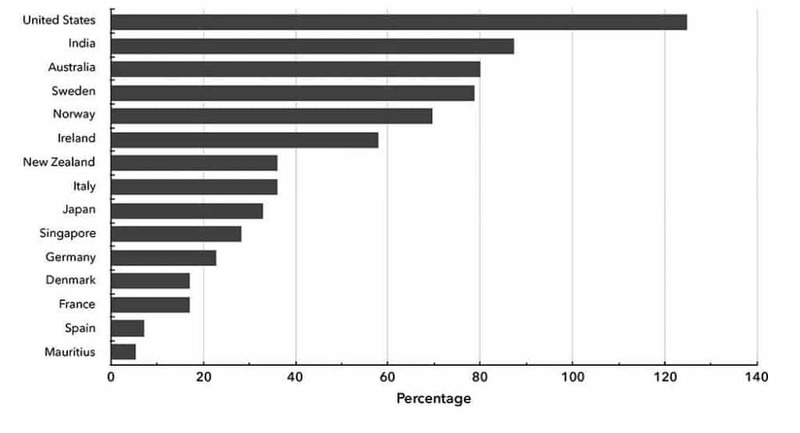 We do have good data for many of the countries listed in Chart 1. Charts 2 and 3 reveal that income inequality has indeed grown in most rich nations. 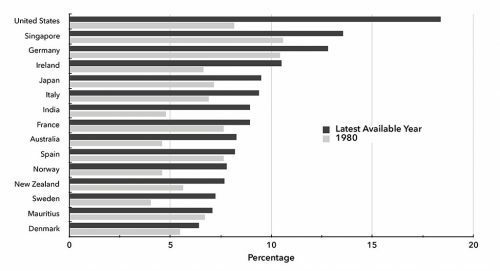 Observe that the Scandinavian nations, long noted for their relatively low levels of inequality, show considerable increases since 1980, a period when neoliberalism took firm hold of the world’s economies. Source: Organization for Economic Cooperation and Development (OECD), Income Distribution Database. Notes: Data are for the latest available year. Adapted from OECD, In It Together: Why Less Inequality Benefits All (Paris: OECD, 2015), 6. 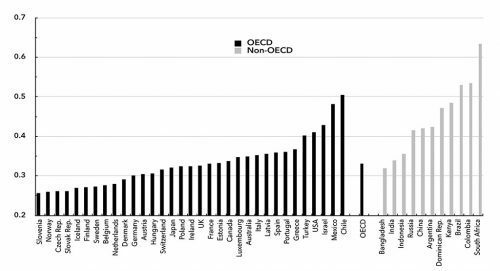 The bar for OECD is the average of OECD member countries. The OECD is an international organization established to foster trade and economic progress. Source: Figures for Charts 2 and 3 were taken from Facundo Alvaredo et al., “World Wealth and Income Database,” World Inequality Lab, http://wid.world, accessed October 2016. 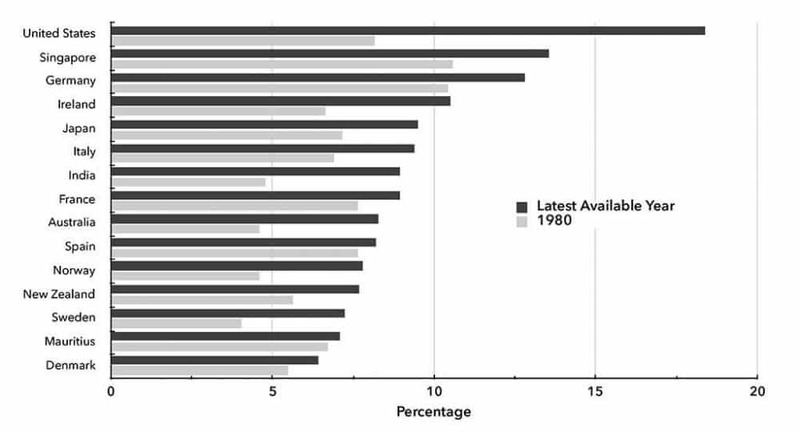 The charts were inspired by Figure 1 in the Oxfam working paper, “Working for the Few,” January 2014. Source: Credit Suisse, Global Wealth Databook 2014 , October 2014, 124, http://publications.credit-suisse.com. Piketty’s perspective takes a considerably longer view. His approach is to calculate the ratio of national wealth to national income, to ask how many years of a country’s total income it would take to equal total wealth. Because wealth represents ownership of assets and is not itself productive, whereas income represents output actually produced in the current year, this ratio represents the weight of ownership relative to present economic activity. In dynamic capitalist economies, with active governments that do not unduly reward ownership per se, this ratio tends to fall. Piketty shows that over most of the twentieth century, it did fall in all rich capitalist countries. However, since around the 1970s, this decline has reversed. For the two reasons noted above, Piketty argues that this ratio will continue to rise, meaning that inequality will worsen, approaching that existing before the First World War. The ultra-wealthy will leave their assets to their children, assets that will continue to grow in money value irrespective of the social productivity of their owners. Societies will be thoroughly dominated by those with the most wealth, and democracy will become more and more a dead letter.6 If we were to examine a random selection of, say, twenty capitalist nations, and analyze their wealth distributions, we would find more similarities than differences. Looking at different nations and determining the extent and direction of inequality is not what is usually meant by global inequality. As Branko Milanovic, a former World Bank economist and pioneer in the study of global inequality, tells us, there are three ways to describe economic disparities worldwide.7 First, we can examine inequality among countries, without reference to individual, household, or family incomes and wealth. This is typically done by finding mean incomes for each country (total national income divided by the number of people) and then calculating a Gini coefficient for these mean incomes. Typically, we are interested in whether or not the national incomes of richer nations are diverging from or converging with those of poorer countries. This is of interest because of the nature of capitalism’s origins and development. From its beginnings in England and Western Europe, capitalism spread, often by means of violence—conquest, colonization, the slave trade—to embrace most of the world. It left in its wake two types of economies, a few rich and many poor. It is remarkable how stable this typology has remained, with a few later additions to the rich countries, over nearly 300 years. At the top in terms of per capita income and wealth stand the nations of Western Europe, the Scandinavian countries, the United States, Australia, New Zealand, and Japan, and perhaps South Korea, Taiwan, and a few others. Moving toward becoming rich capitalist countries might be China, Brazil, India, and Russia, though it is by no means certain that they will achieve this status. The rest of the world is mired in multiple kinds of misery, though most have a small stratum of high income and wealthy individuals. As with the ability of the economic elite to secure fortunes across many generations, so too those capitalist countries that developed first have been able to maintain their global dominance. Given that no capitalist economy, nor indeed the global capitalist economy, has grown at anywhere near an annual rate of 3 percent for 100 years, much less 377, this seems unlikely indeed. Even China, with its astonishing recent growth rates—which have also begun to slow—will not be able to sustain such a rate for more than a century. Pritchett’s study noted the divergence between 1870 and 1960. What has happened since then? Milanovic shows that global inequality according to this first concept was roughly constant between 1960 and 1980, rose dramatically from 1980 until 2000, fell until the beginning of recovery after the Great Recession, and then began to rise again. Irrespective of the fall in the 2000s, inequality among nations is still extremely high, much higher than in 1960. No real convergence has taken place. The second method of calculating global inequality recognizes the fact that nations have widely different populations. With the first technique, each country has equal weight, the least populated the same as the most. With the second, national income is weighted by each country’s population, which means, for example, that a rising per capita income in China counts for much more than a similar increase in Tanzania. If we do this and then look for divergence or convergence, we see a slight convergence between rich and poor nations from 1950 until 1990. However, after 1990, there is a sharp convergence. While most poor countries are not converging, the two largest ones, China and India, are. Incomes for hundreds of millions of Chinese and Indians have risen dramatically, and because these nations have a combined population of 2.7 billion—37.5 percent of the world’s population—they count for much more than most nations in terms of national income. They alone account for the convergence shown by method 2. If we excluded them, there would be no convergence between rich and poor places. It is interesting to note that despite the fact that incomes have risen for many Indians and Chinese, inequality in both wealth and income have risen significantly in both countries. Furthermore, while money incomes are higher for peasants in China than they were before its leaders pushed it sharply toward capitalism, more than 600 million rural residents have lost their communal lands and their collectively provided food rations and medical care, none of which is subtracted from their current money incomes. Furthermore, the likelihood that either China or India will continue on a path of such high growth is negligible. No society can suppress consumption indefinitely to finance capital spending, which is the engine of economic growth. Workers have to be exploited, reserves of labor have to be moved, by force or otherwise, from the countryside to urban areas, and the misery caused by these must certainly generate opposition, such as strikes, demonstrations, and violence. None of these acts of class struggle please global capital, and if they happen often enough, or if the ruling elites in India and China allow wages and employment conditions to improve, firms will shift their capital elsewhere. This movement has already begun in China, as pressure from workers has forced up wages.10 And even if we suppose that stratospheric growth can be sustained, it will soon enough generate environmental catastrophe. Already both nations foul the atmosphere and otherwise degrade the Earth to an unconscionable degree. China has made some efforts to moderate the despoliation of its air, water, and land, but not nearly enough to counter its insatiable demand for fossil fuels. India hasn’t done much of anything.11 All of this strongly suggests that economic equality among nations is a pipedream, and whatever convergence has taken place will not last. The third manner in which we can define and measure inequality is what Milanovic terms “true global inequality.” Here, what is done within countries is done for the world. Household incomes or wealth are tabulated from a sample of household surveys in as many nations as possible, and then the usual division into quintiles, deciles, ventiles, or percentiles allows us to see trends in distribution. Such canvasing does not take place very often, and not at all before the late 1980s. Before this, some major countries did not do household surveys, and even today, there are nations, mainly among the poorest, that do not conduct them. Therefore, the available data are recent, and not inclusive; we have to take them with a grain of salt. This is not to say that the data are wrong, only that the margin of error is larger than we might like. What do we see if we look at world inequality at the household level? To make comparisons across countries, household incomes have to be put on a common footing. This is done through the use of “purchasing power parity” (PPP) exchange rates. That is, we take a basket of goods and services and ask what the basket would cost in each country. If, for example, it cost $1,000 in the United States and 60,000 rupees in India, the dollar–rupee exchange rate will be 60 rupees per dollar. A household in India with a yearly income of 1,000,000 rupees would have the same income as a U.S. household with a yearly income of $16,667 (one million divided by sixty). We could convert every household income in the world into dollars (or any other currency) in this way. Then we could rank the incomes from lowest to highest and construct a standard income distribution table, showing, for example, the share of global income received by the poorest 20 percent, the next poorest, the middle, the next richest, and the richest 20 percent. We could also measure the income share of the richest 5 and 1 percent, and so forth. A Gini coefficient could easily be calculated. Third, as of 2008, when the last surveys were taken, global inequality appears to have fallen slightly. If true, this trend is probably attributable to a decline in the number of truly destitute persons, at least in terms of money income, in China and India.13 However, this decrease must be seen in the context of the astonishingly high level of income disparity from which it is measured. If I make a billion dollars a year, and you make $1,000, and then you see an increase of a few thousand dollars, you are closer to me, but the deeply unequal distribution of power and wealth remains essentially unchanged. Fourth, the spread of market relationships over the past several decades has created economic winners and losers. Between 1988 and 2008, the global 1 percent have seen their incomes increase substantially and those between the 90th and 99th percentile saw moderate gains, while those in the bottom 5 percent faced stagnant incomes and fell further behind. Surprisingly, those between the 75th and 90th percentile did not gain, and some actually lost income. 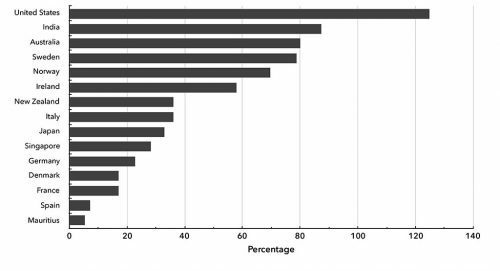 Also of importance is that the quarter of households above the bottom 5 percent gained income, as did what Milanovic calls the “global middle class.” Among the latter group are “some 200 million Chinese, 90 million Indians, and about 30 million people each from Indonesia, Brazil and Egypt.”14 Undoubtedly, the Great Recession and slow recovery have weakened income growth for all but the extremely wealthy. And this might have dampened the rising expectations of globalization’s “winners.” However, the global middle class (between the 50th and 60th percentile) exerts a conservative, constraining influence on politics that should not be overlooked. Those with a growing stake in maintaining their incomes and consumption are unlikely to participate in efforts to bring about radical change. Even if we suppose that diminished economic prospects anger many in this group, the result might be a politics of resentment against those below them—as shown by the recent resurgence of the far right in Europe and the United States. What can we conclude from this excursion into statistics? If we can say one thing for certain, it is that the world is structured economically and politically in an extremely unequal way. Wherever we look, whether in the rich capitalist nations, rapidly growing ones like China and India, or the poorest countries, the richest people take the lion’s share of income and wealth, and most of the increases over the past forty years have accrued to them. Everywhere, this translates into disproportionate elite power in all spheres of life. What is more, although many millions of poor people are now a bit less unfortunate, there is no reason to expect sharp increases in equality, either in the near future or many years from now. Given this, without major oppositional efforts by workers, peasants, the unemployed, and the dispossessed, the world will grow increasingly undemocratic and oligarchic. With respect to the forces responsible for inequality around the world, the one that stands out is the inability of working people and peasants to mount credible resistance. In the most advanced capitalist nations, labor union density has fallen, sometimes, as in the United States, precipitously. Unions and labor movements always have reduced inequality.15 Their power in Western Europe and the Scandinavian countries is the main reason why these nations exhibit greater income equality than almost any other region on earth. Yet even in these places, labor has steadily weakened, leaving it unable to counter the growing power of capital. With the demise of the Soviet Union, which, despite its own, comparatively minor inequalities, served as an ideological counterweight to capitalist hegemony, employers and governments in Europe have far less incentive to provide for the social welfare and security of workers, who are left without any vision of a viable radical alternative. Capital now moves freely across borders, seeking ever cheaper labor and further limiting labor’s power. In the poorer countries to which capital increasingly flows, notably China and India (but also Vietnam, Indonesia, and elsewhere in Southeast Asia), elites seek to keep wages low so that corporate profits remain high and their share of those profits continues to rise. At the same time, tens of millions of peasants have been forced from their land, providing a ready reserve army of labor in towns and cities. States do whatever is necessary to maintain safe and prosperous havens for transnational companies, including extreme violence. They also employ the time-honored tactics of divide-and-conquer, pitting ethnic or religious groups against each other. Occasionally, governments will allow for some minimal relief from the misery of the masses of workers and peasants, if only to neutralize more aggressive antagonism of those who have lost income and wealth, or those whose upward mobility seems permanently blocked. When people who toil for a living are quiescent, capital is given free reign, and governments are more than willing to grant businesses and their wealthy owners every kind of concession, from tax exemptions to abolition or non-enforcement of environmental protections. In recent years new protest movements have broken out around the world, all of them arguably rooted in burgeoning inequality or the structures that cause it. The Arab Spring was fueled by suppression of workers’ rights, increases in the prices of necessities like bread, capital-friendly political leaders, an absence of democracy, theft of peasant lands, lack of employment opportunities, declining real wages, and much more. Workers in China have been striking and protesting in record numbers, angered by long hours, low wages, unsafe workplaces, poor or no housing, unbreathable air, an autocratic government, and the seemingly unlimited wealth and power of their bosses. In India, peasants, under the banner of communist parties, have begun to wage guerilla war. In France, workers take to the streets every time the government seeks to lower their living standards. In the United States, uprisings from the Occupy movement to Black Lives Matter and the Fight for $15 have taken place. The same is true in Canada. In nearly every country, resistance is stirring. Yet despite these efforts, victories have been fleeting. A military dictatorship once again rules Egypt. Civil war engulfs Ukraine. China’s undemocratic and autocratic Communist Party is still firmly in control of the country’s politics and society. The Venezuelan government is struggling to continue the Bolivarian Revolution begun by Hugo Chavez, but plummeting oil prices and U.S. sabotage have put Venezuela’s future as an important outpost of noncapitalist development in jeopardy. Throughout the world, protest has often devolved into ethnic and religious violence and warfare. What then, might be done to counter inequality and put the world on a more peaceful and egalitarian path? Thomas Piketty and Branko Milanovic give detailed suggestions, which on their face are unobjectionable. Piketty recommends a global progressive wealth tax, enforced by an agreement among nations. Funds from such a tax could be used to enact policies that greatly narrow the gap between richer and poorer. Milanovic argues that global inequality can be attacked by rich countries transferring income to poorer nations, by poor persons migrating to rich countries, and by people fighting for greater equality within nations. Piketty proposes that his tax be debated democratically and then enacted through political consensus. This seems naïve, especially because the rapid growth of inequality has itself precluded democratic debate. Milanovic, by contrast, is skeptical of the feasibility of his own first two suggestions. Rich nations now give precious little aid to poor ones—except in the form of loans and funding programs that demand strict fiscal discipline—and political realities make this unlikely to change. Milanovic appears to believe that mass outmigration by the poor to wealthy countries would greatly benefit the new immigrants. This is because, for example, even the poorest 20 percent of Danish households have an average income equal to the 80th percentile of the world’s households. He admits that today’s political climate makes this unrealistic. But even if there were large-scale migrations, the recent arrivals would swamp low-wage labor markets, lowering the wages of all poor workers, while the immigrants would suffer the worst kinds of exploitation, not a circumstance likely to advance their or their children’s life prospects. Surely, we should be free to move to wherever we choose, and we should also have, as labor journalist, photographer, and activist, David Bacon argues, “the right to stay home.”16 But neither will matter much without efforts to enforce these rights. Workers in rich and poor countries face almost incomprehensibly different circumstances, unlike when Marx lived. So what still unites them? Here, Milanovic has a point, but he is wrong in three senses. First, solidarity is notoriously difficult to forge in any single nation. Second, acts of international solidarity are not unique, as a perusal of Labor Notes and similar publications shows. Third, there really is no choice but for whatever ties bind us objectively to begin to bind us subjectively. To speak in the most universal terms: we all want democracy. We are all exploited by our country’s and the world’s economic masters. We all want this to end, so that we might enjoy the fruits of our labor and happier, healthier lives. We all want healthcare, pensions, vacations, holidays, quality education, control over our labor, work that uses our full human capacities, societies in which children can grow up safe and healthy, livable environments, an end to war and other violence, and much more. There are still plenty of things to unite us. Those of us in the rich capitalist nations have special responsibilities in all of these struggles. It is, after all, our countries that have immiserated the rest of the world. We need, first of all, to get our own houses in order, fostering solidarity at home as we confront our employers and our governments. We must do all we can to end the imperialism that wreaks more havoc around the planet every day. Second, we must join forces, as often and in whatever ways possible, with those suffering elsewhere, no matter how far away and no matter the issue. We must firmly reject the mindless nationalism that makes international cohesion so difficult. In the face of such global violence, poverty, and injustice, it can be difficult to retain any hope for a future beyond capitalism. But if the reality of global inequality inspires what Antonio Gramsci famously called “pessimism of the intellect,” the real work must begin with what he called “optimism of the will”—the undaunted commitment that drives radical change. 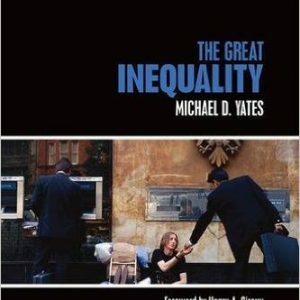 ↩Michael D. Yates, “The Great Inequality,” Monthly Review 63, no. 10 (March 2012): 1–18. ↩World Economic Forum, Outlook on the Global Agenda 2014 (Geneva: World Economic Forum, 2013), 12a, http://weforum.org. ↩Credit Suisse, Global Wealth Databook 2014 , October 2014, http://publications.credit-suisse.com. ↩For a detailed review of Piketty’s book, see John Bellamy Foster and Michael D. Yates, “Piketty and the Crisis of Neoclassical Economics,” Monthly Review 66, no. 6 (November 2015): 1–24. ↩Credit Suisse, Global Wealth Databook 2014 , 127. ↩Branko Milanovic, “Global Income Inequality in Numbers: In History and Now,” Global Policy 4, no. 2 (2013): 198–208. ↩Lant Pritchett, “Forget Convergence: Divergence Past, Present, and Future,” Finance and Development 33, no. 2 (1996): 40, http://imf.org. ↩“A Tightening Grip: Rising Chinese Wages Will Only Strengthen Asia’s Hold on Manufacturing,” Economist , March 14, 2015, http://economist.com. ↩See Richard Smith, “China’s Communist-Capitalist Ecological Apocalypse,” Real-World Economics Review 71 (2015): 19–63; Edward Wong, “Cost of Environmental Damage in China Growing Rapidly Amid Industrialization,” New York Times , March 29, 2013, http://nytimes.com; Akash Kapur, “India Is Burning: How Rapid Growth Is Destroying Its Environment and Future,” The Atlantic , February 16, 2012, http://theatlantic.com. ↩Milanovic, “Global Income Inequality by the Numbers,” 201. ↩Milanovic, “Global Income Inequality by the Numbers,” 202. ↩Florence Jaumotte and Carolina Osorio Buitroni, “Power from the People,” Finance and Development 52 no. 1 (March 2015): 29–31, http://imf.org. ↩David Bacon, The Right to Stay Home: How US Policy Drives Mexican Migration (Boston: Beacon, 2013). ↩Michael D. Yates, The Great Inequality (London: Routledge, 2016), chapter 11 (“The Growing Degradation of Work and Life and What We Might Do To End It”) and chapter 10 (“OWS and the Importance of Political Slogans”). ↩Milanovic, “Global Income Inequality by the Numbers,” 207–08.